They've been put on ice until an exploit is fixed. If you've made plans to complete some daily or weekly projects in The Division 2, post-apocalyptic D.C. is going to have to make do without your help for a little while longer. An exploit had led to them being disabled until the issue is fixed. Servers went down on Sunday with only a few minutes of warning after the exploit appeared. It allowed players to get rewards from projects multiple times, netting them a nice windfall. 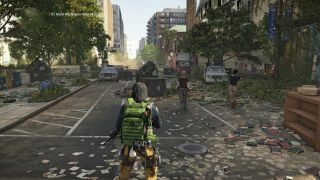 The Division 2 was only down briefly, but the restart didn't fix the issue. Players were allowed back in after 15 minutes, but they haven't been able to complete projects or get the loot they provide since. They've been disabled for a day, but there's no word of a fix yet. Keep an eye on this post for updates. The last patch also seems to have made signature weapon ammo a rare commodity, with some players reporting that they've not found any, while others have noted that it's harder to find. The issue's being investigated. Bugs aside, the update sounds like a strong addition to the endgame. Samuel jumped in last week and called it "some of the most fun I've had playing a third-person shooter in years". Check out his Tidal Basin impressions.